I have been married for about a year (actually, tomorrow, July 10, will be a year exactly–Happy Anniversary!) 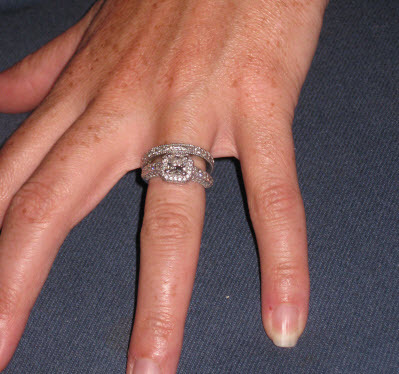 Anyway, Phil went through a painstaking process of choosing the exact perfect ring for me–he took our friends Stacy and Robin to help him choose, he inspected several different diamonds to get the one he really wanted and he ended up choosing a magnificent ring. The kind a girl dreams about. I love it! It is important to note, I am a middle school teacher whose is constantly telling my students before our big end of year field trip to Washington, D.C., “Don’t bring anything that you don’t want to lose.” Now, when you think about it, this is a pretty good philosophy, especially for 13 year-olds. However, I’ve decided the same is true for me. The solution, of course, is to leave my rings safely at home. However, I still want to have a wedding band so I still look respectable traveling with this married man. I decided to get a fairly inexpensive, very plain wedding band for the trip. I went to my friendly neighborhood Zales at 79th and Broadway and bought the band you see below. With taxes, it was about $185.00. I have worn it quite a bit since I bought it as it is perfect for playing softball, cleaning the apartment or going for a run (all things I would have just done without my rings on before). It is really comfortable and I kind of love the simplicity of it. 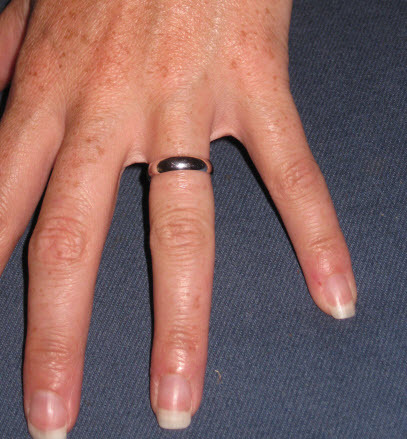 Also, it is nice that even in those small moments when I am sweaty from working out or up to my ears in dust and grime, I have this ring on my finger. It makes me smile.